Du Juan goes retro sophisticate in Dior Haute Couture for this dramatic editorial photographed by Yin Chao for Numéro. Loving the spot of this editorial!! I love the dramatic hair and gorgeous styling! I am going to pin this Rowena! It is so beautiful. Love the outfit in the third picture and that red coat is super fabulous awesome! Thanks for sharing this! Stunning! She's so gorgeous and I love how they did her makeup. All these outfits are fabulous but the one in the third photo is my absolute favorite. Thanks for sharing Rowena. 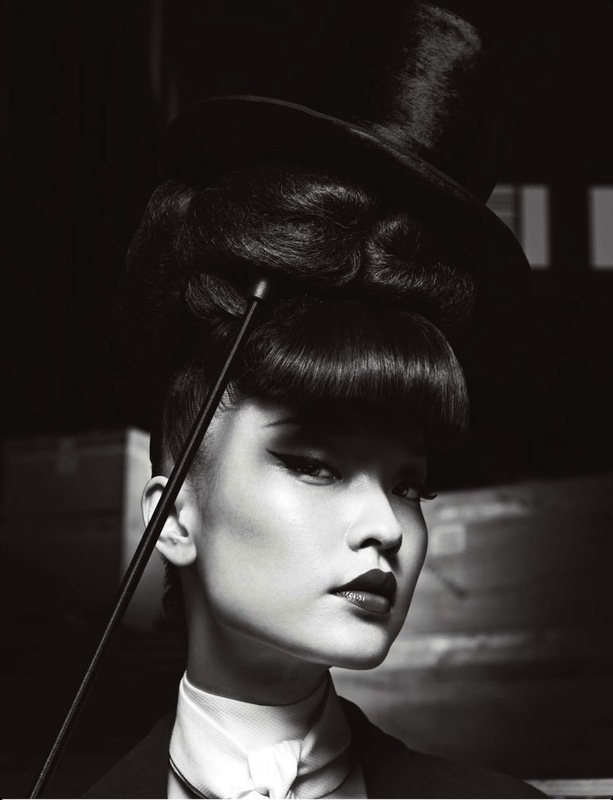 Adore this entire shoot, from props/backdrop, styling to the hair and make up... Stunning! That last shot is beautiful. These outfits are soo incredible...B&W photos definitely have moments when I prefer them over color! Hi Lovely, thanks for your kind visit! I am amazed by the dress in the second image, how apt for the futuristic theme. The hairstyling also goes perfectly with it. How awesome is that red coat! Happy Friday! these pictures are absolutely beauti ful!!! there's something with the pictures that definitely will catch your eye!!! and i love specially the black & white! take care. have a lovely weekend dear!!! These photos are absolutely beautiful. It's a very nice editorial. I love these classy and elegant outfits too. Dramatic and creative images - a gorgeous editorial. The red coat is a stunning design. This is brilliant, I love it, great find. Absolutely stunning!!!! Thanks so much for sharing such a fabulous editorial!! Have a great weekend! Hi Rowena, I appreciate your lovely words, have a wonderful and warm weekend! Wow! These are some amazing photos! I love the dramatic shapes and fun accessories! Inspiring indeed! I liked your post on bloglovin! Her hair in itself is a masterpiece! I love it! I love your blog... Would you like to follow each other? Let me know so I can follow you back, dear! Wow these photos are absolutely breathtaking. Du Juan looks absolutely gorgeous. They are all so dramatic, I like the one with color the best. I really liked FBND, they are only 45 minutes each and I think I watched it all very fast. I liked all the characters, even the one I wanted to be annoyed by. I skipped the two extra episodes that were interviews and out-takes. I haven't really found anything to watch since then but I guess I don't have much time these days so it may be a good thing. Sweetie, you always find the most beautiful editorials! This retro and glamorous shoot is perfection! Hope you are having a lovely weekend, my dear friend! Classically beautiful photos! There is always beauty in black and whites. Gorgeous. And in the red at the end, simple striking. She is stunning! I wish my everyday wardrobe looked like this, haha. Wow. She's full of grace! Love all her poses and beautiful eye makeup.